Bali day 2! 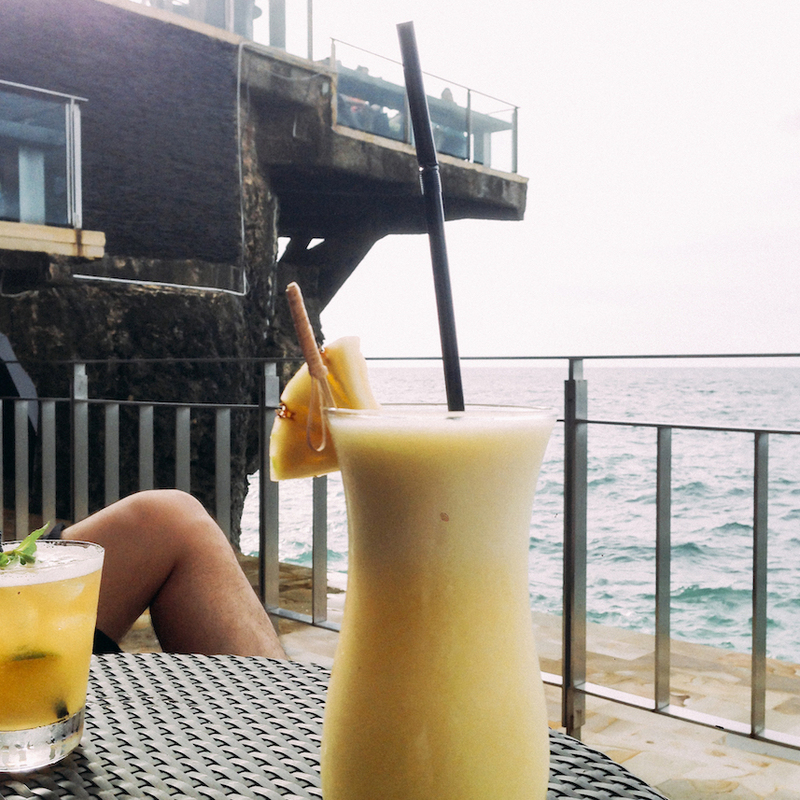 Today is a brand new day, and we’re gonna play at the beach and hang out at Rock Bar Ayana. Well, at least that’s what I had in mind when I woke up on this Monday, Dec 29. It’s better to wake up with a positive mood, right? At least for me, that morning mood hugely impact the whole day. Getting close to the end of the year, TV news, social media, they’re all started to busy with new year’s buzz. 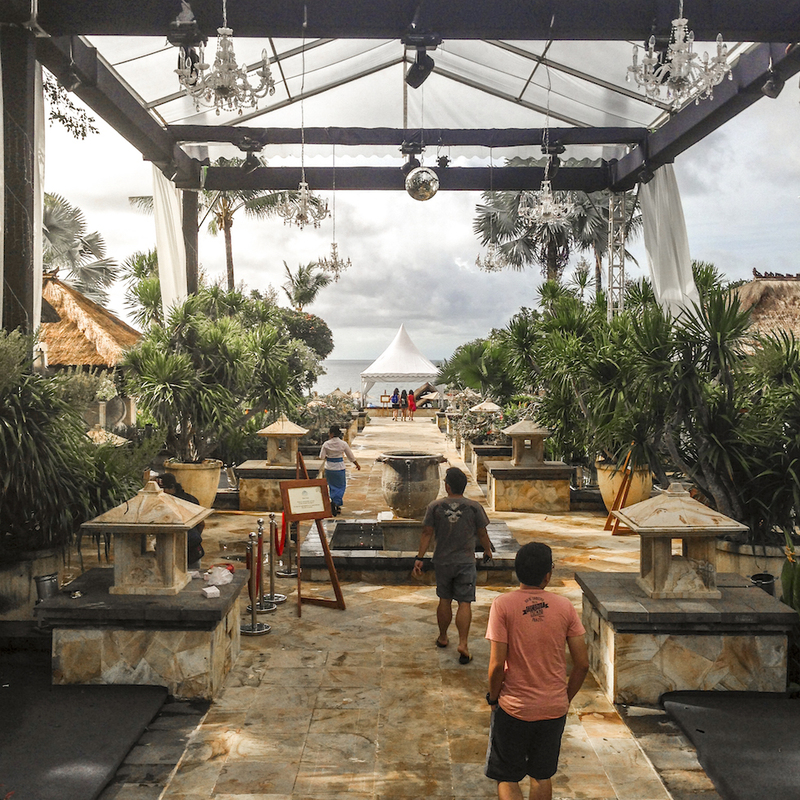 Today, we’re gettin’ ready pretty quick, we left the hotels before 9 a.m. because we’re planning to enjoy the Pandawa Beach, our first stop for the day. We took a quick breakfast, before Mr. Made, our local driver arrived to pick us up. 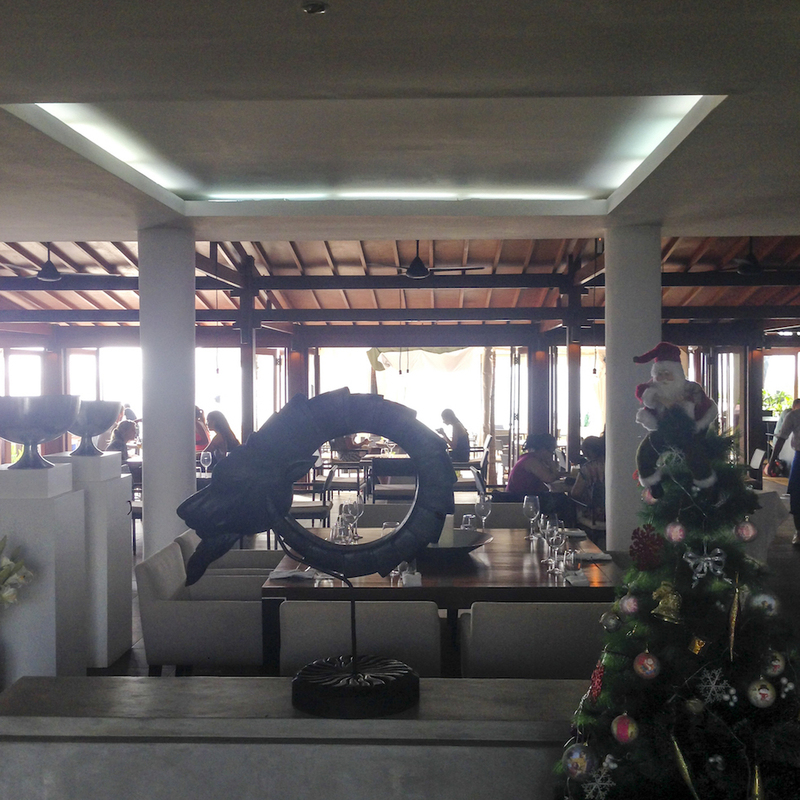 The breakfast at Serela Hotel Kuta was not bad, it’s acceptable with quite a variety of food. 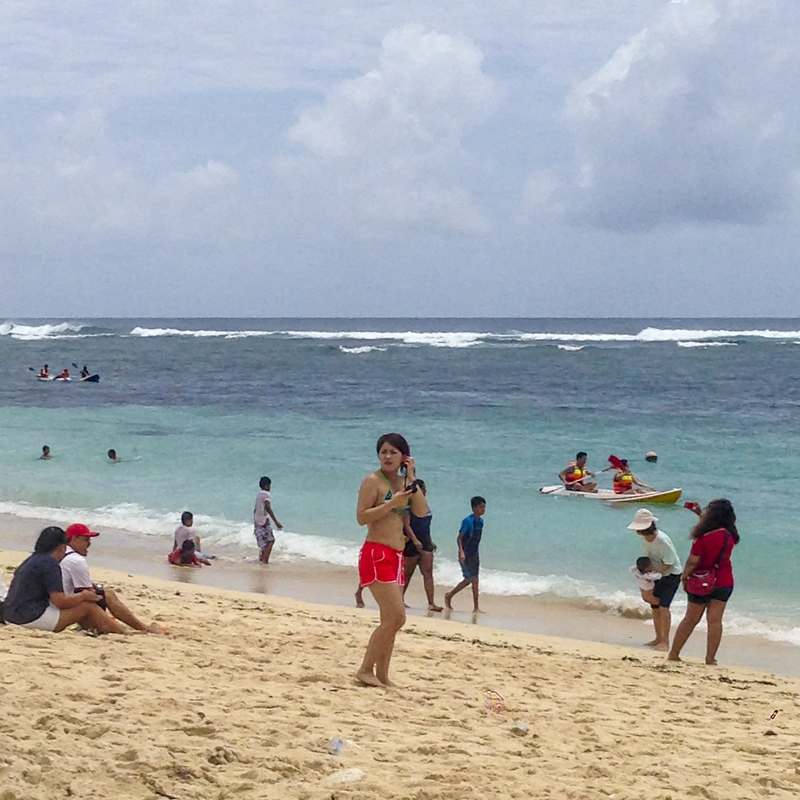 It took about 30 – 45 minutes to get to Pandawa beach. 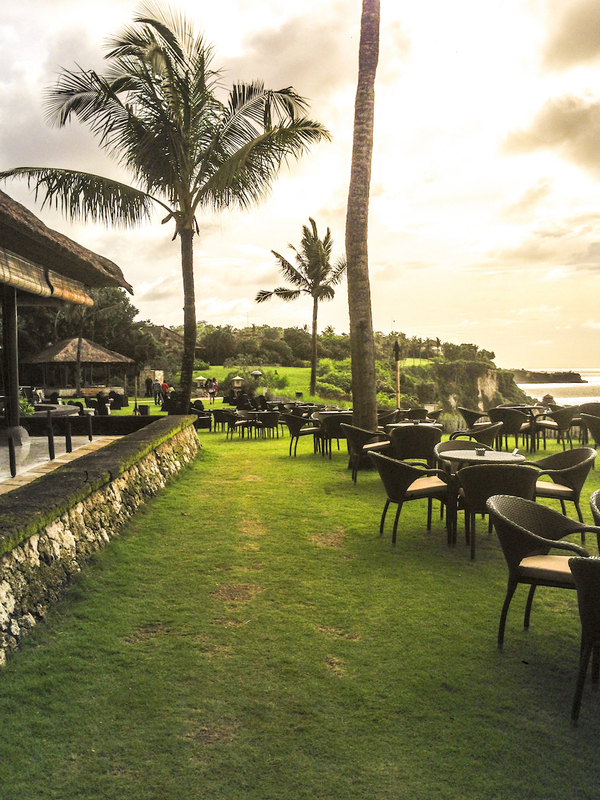 Located in southern Bali, Kutuh village, Badung, just approx. 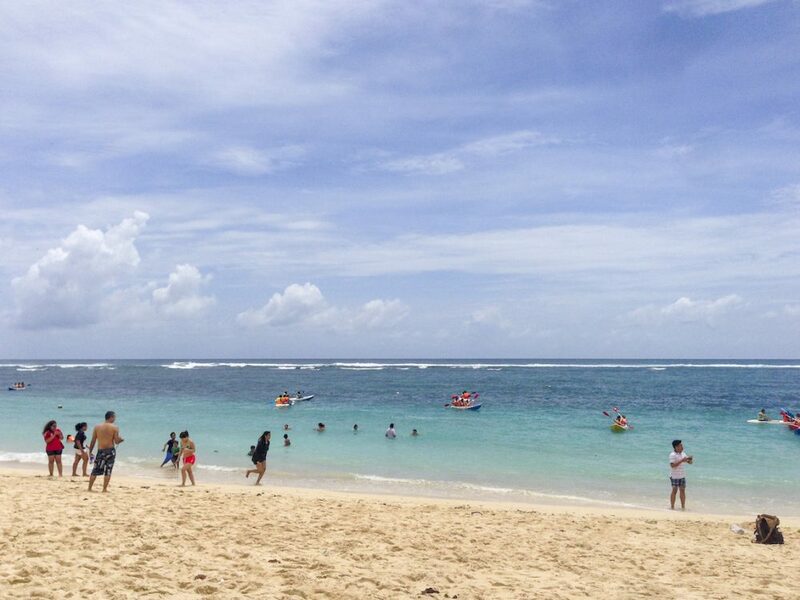 3 km drive away from Nusa Dua beach. 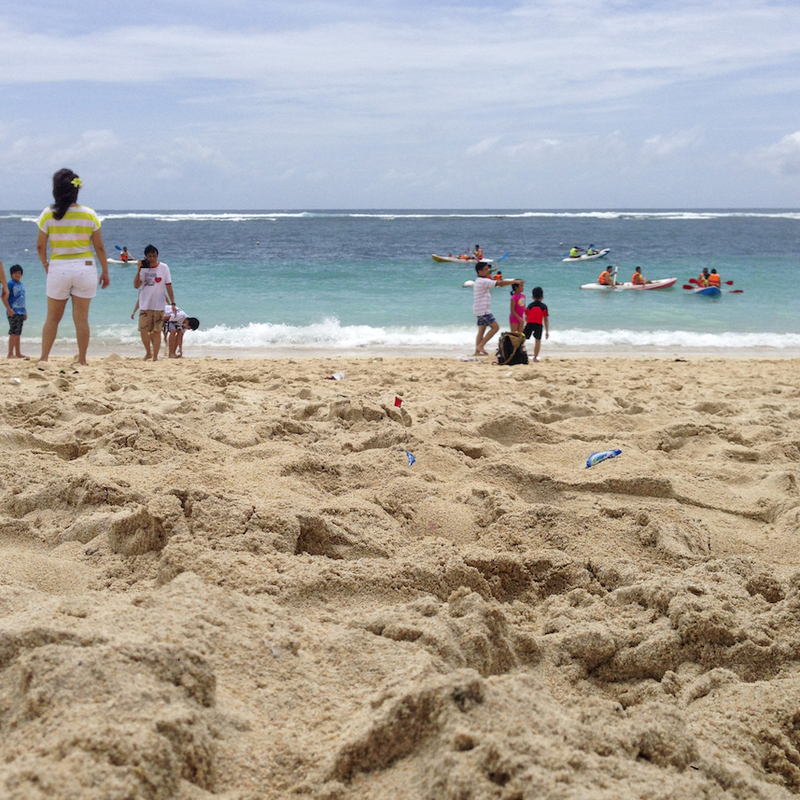 As one of the newest beach, it’s really becoming a very popular attraction in Bali. New? Yes, it’s known as a ‘secret beach’ because of the location, hidden behind two giant cliffs with barely any access. 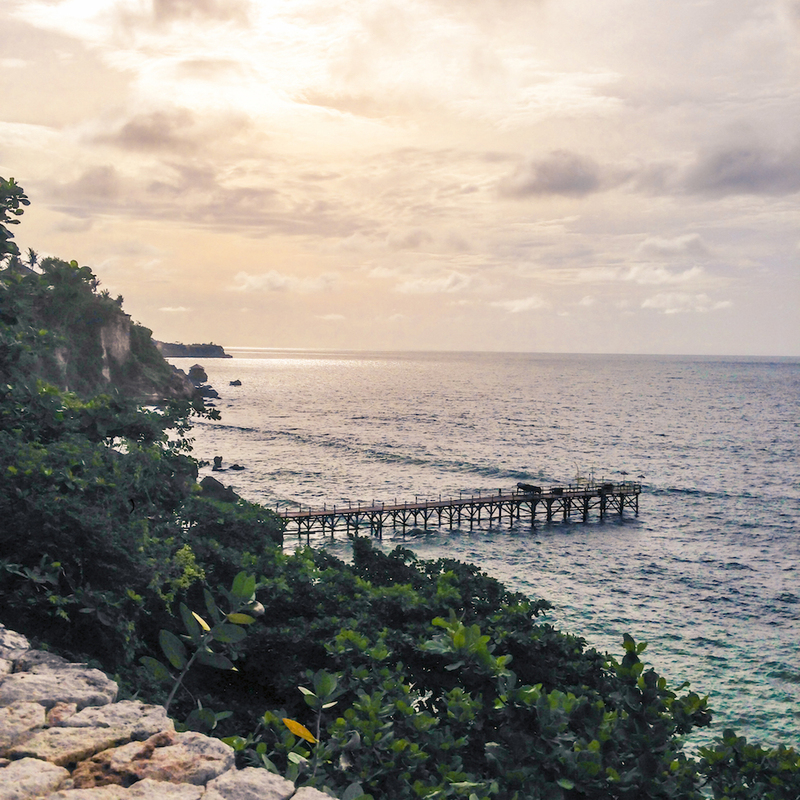 But thanks to the Badung regency, they open up the access as far as 1.5 km through the cliffs. Driving through the cliffs already was a good intro for the day, it’s quite beautiful. After the cliffs, here come the ‘gems’. 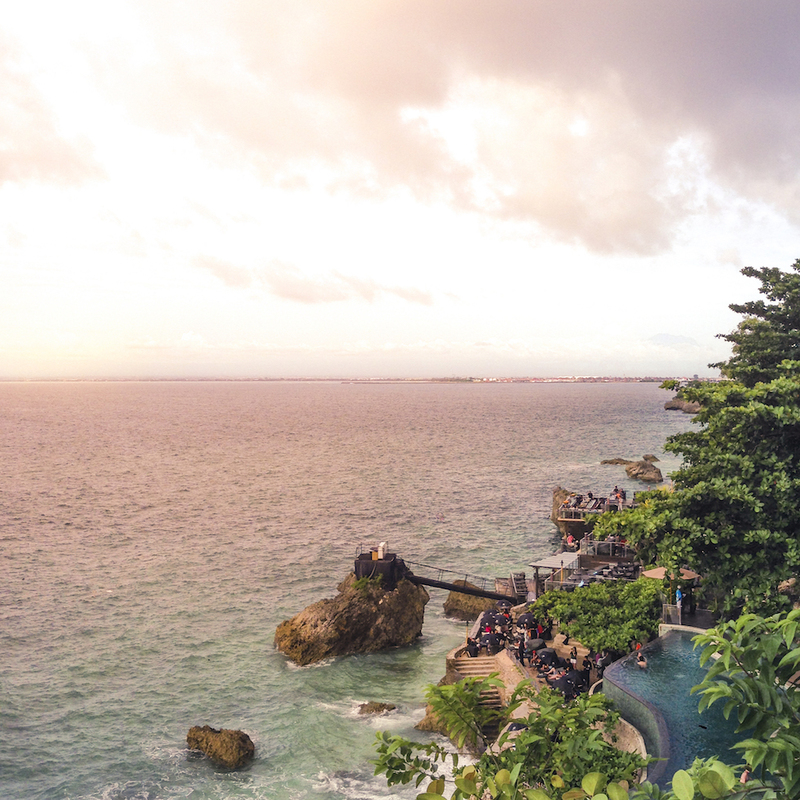 There’s a first stop point to check the panoramic view of the beach from the upper side, just before the 5 beautiful big statues of Hindu’s God of Yudhistira, Bima, Arjuna, Nakula, and Sadewa. The name Pandawa itself derived from a Wayang thing ‘Panca Pandawa’ (Panca = Five). It’s quite a lot of people here when we arrived, there seems like an event or bazaar going on, some sales promotion girls trying to sell drinks & foods. There seems a preparation for a concert (or a clear up, because it’s Monday, the concert probably Sunday). Now, this beautiful white sands, clear blue water, and a long coastline as far as the eyes can see. Not bad for a welcome note. It is beautiful, lovely. No wonder if this island gets the title “Island of The Gods”. It deserved the glorious title, and it’s just this one beach. Walking to the left side of the beach, we’re trying to find an empty beach chair which rented for IDR 50K each for unlimited time. Taking off our clothes, and we’re off to the water. We’re lucky at this hour, the sun was actually pretty friendly. At least for the first 15 minutes. The hell with that… We’re in the water already..
Never forget your lotion when you’re going to the beach, don’t want a skin cancer, nope…. Coconut and corn pretty good, around 10K depends on high season or not. Meet my two stupid friends, both spent up to 10 minutes to just get on this thing. Getting on it seems like an achievement for the day. Rent 50K for half an hour. 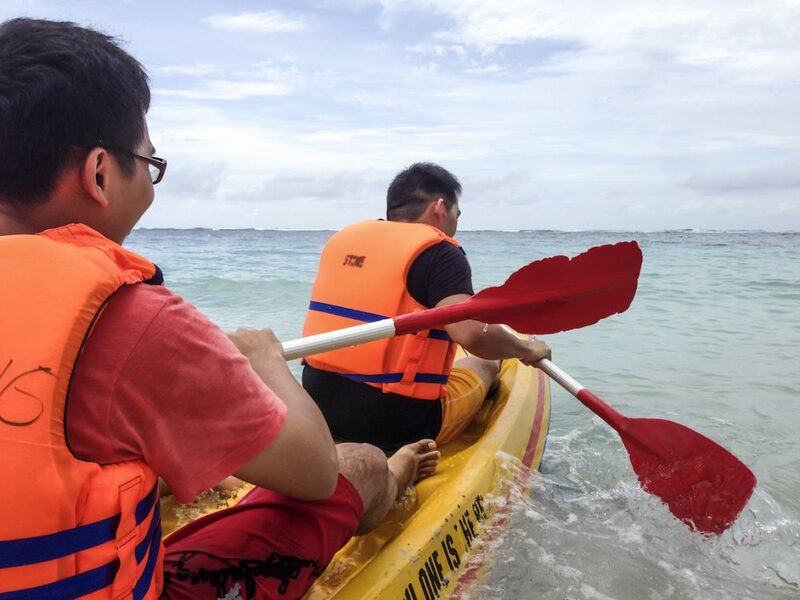 Paddling is actually pretty hard, it’s not that easy, my hands gets tired. Applause for those athletes who paddles like a monster. Oh, hey there! R u lost? Satisfied with Pandawa, guess we had enough of it. Time moves fast, it’s almost 1 p.m. already. And we still have two places to go. 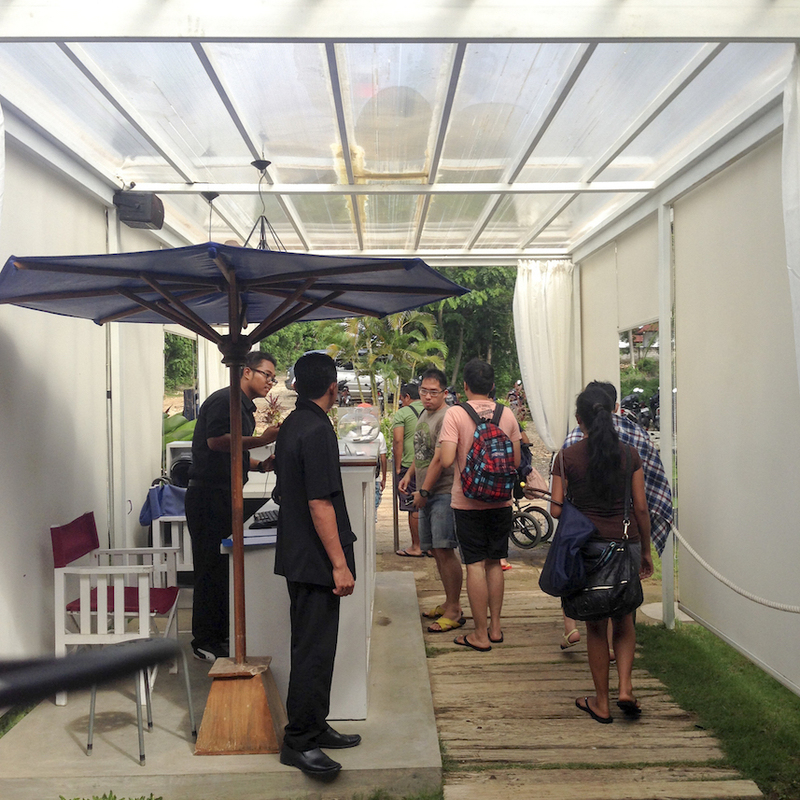 Quickly move to find a bathroom to wash, there’s some bathroom rent just between those huts that sells food and drinks. Of course, you’re gonna have to pay for it, mine was 5k for a quick wash. That was nice, Pandawa.. Goodbye. Leaving the beach, now we’re looking for lunch. My friend took us to the one and only, El Kabron, Spanish restaurant & cliff club. Sometimes known as, El Kabron, Ibiza style beach club (Duh! Obviously overrated). If you’re surfing the internet, there’s a lot of negative reviews for this place. 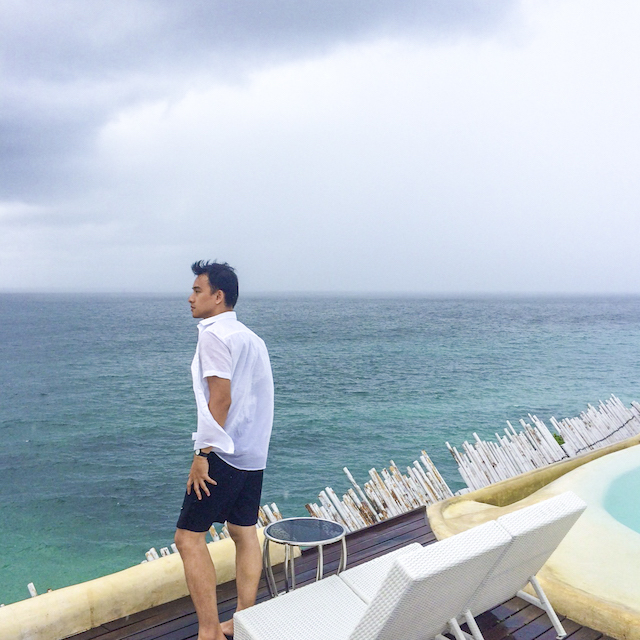 Let me…..
It’s raining as soon as we leave from the southeast part to the northwest part of ‘South Bali’. It’s a 30 minutes drive (supposed to), but because the location turned out to be quite remote and our driver never been there, sooo it took us a while. Driving here while it’s raining hard was really annoying, well obviously you’re driving up to the cliff. But eventually, we made it after asking the locals a couple of times. Of course after a long wait in the car with starving stomach, sometimes we as a human can get a little bit too emotional. As soon as we get off the car, we see a reception table just in front of the entrance, with no staff. So we wait, and then finally there’s this one guy coming out. I thought by the name, we’re gonna experience at least some pleasant services. But na ah, not this time. I didn’t know what conversation happening between my friend and the staff, I was going to toilet first. But then I know that the staff “questioning” us if we could afford to eat here. The heck?!! That kind of information could instantly boil your blood rushing to the top of your head in milliseconds..! For real. At least I had it. Basically, my friend was looking through the menu book at the reception area, while waiting for me. Somehow the staff starts to ask him and starts to telling him that there is a minimum spending at this restaurant, that will be 300k / person before tax. The worst part that makes me really go, “ok, that’s it, we ARE being underestimated..” was when he’s trying to tell us over again and again for the minimum spending of 300K / person. Iya kak, ini minimal 300 ribu loh… 300 ribu kak.. Itu per orang… bla3..” until we said “Iyaaa…..! We chose to sit at the outdoor. It’s raining, so only an Indonesian family and a group of Australian tourists there. Later when we’re leaving then the place starts to get full. Actually, the view here was quite nice. They have a pool, where you can enjoy by the cliff side. The view from their cliff is nice. Too bad it’s raining so we didn’t really enjoy the best view. I bet sunset is awesome with this view. Must be nice to enjoy that cliff during sunset. Or enjoying the pool on the cliff. Well, the water was actually a bit dirty when I was there, plus nobody allowed to use the pool when it’s raining. Ok now the food, this is what we have for lunch. We only had what the staff recommended.I didn’t remember the name of the food that we order, because I’m too pissed with that intro, and too hungry to even bother with the menu, plus too distracted with the view. 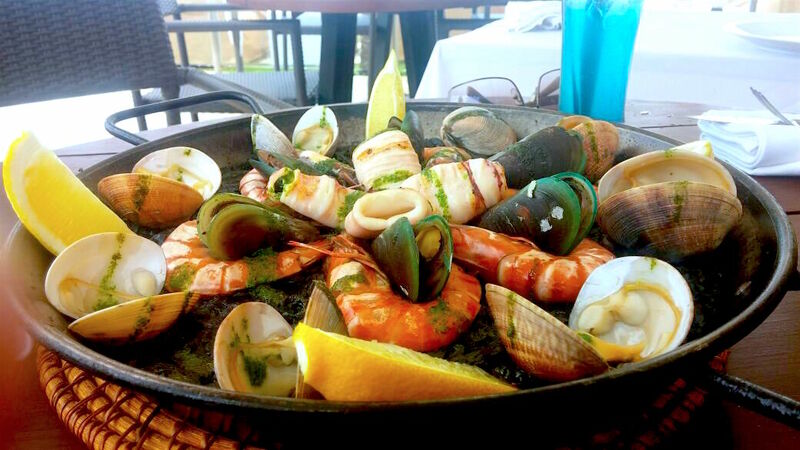 What I remember was those seafood taste nothing like Spanish food, it’s boring and it’s not as good as their fancy name. 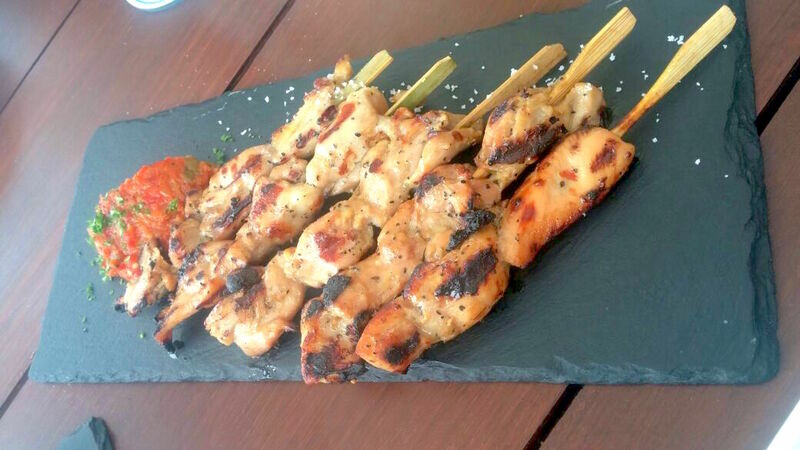 The satay was quite ok, though. We finish our food in about 1 hour later, because the waiting time was more than 30 minutes. Enough of El Kabron, pay the bills for IDR 926,640. Rain Cover for The Outdoor Seats. Because we’re locals and these locals that I saw leaving after looking through the menu, maybe the reason why the staff acted like that. Maybe it’s the price that makes those people drove away after looking at the menus, or it could be the food that they don’t understand. A little advice for all of us, wherever you go, wherever you eat, do a little research, will ya? It’s not that hard to just google, or even read a little more on review sites such as Trip Advisor. There you’ll get information about location, services, what kind of food do they serve, does it suits my appetite, can I eat these kinds of food and most important the price info estimation! So this kind of humiliation will stop! Hahaha… (So much drama). They drove pretty far to get here, though. What a waste of time and energy. Do your research, alright? Next stop! 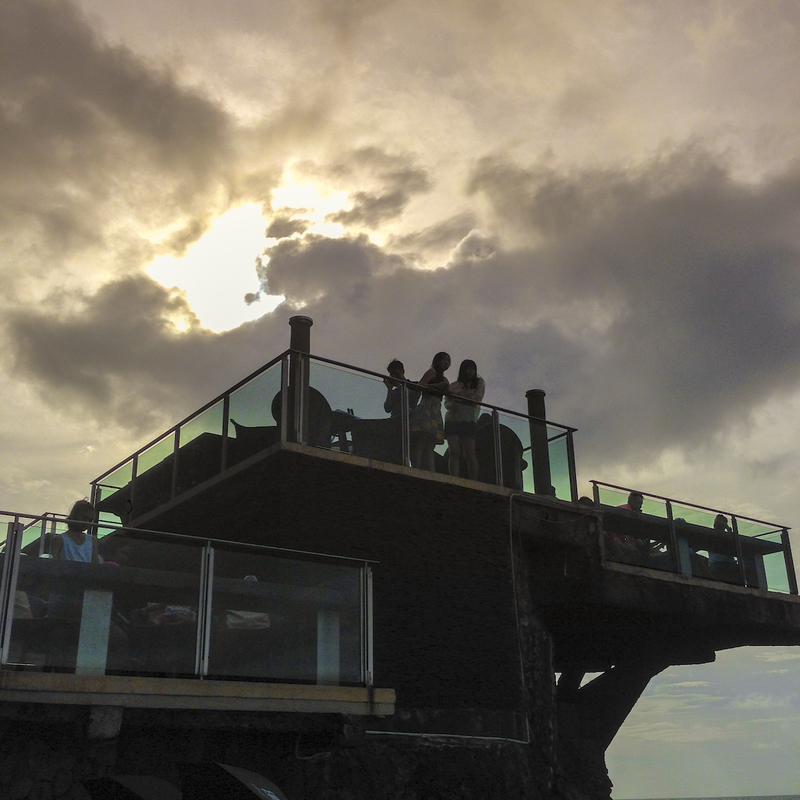 The super popular, Rock Bar, Ayana. 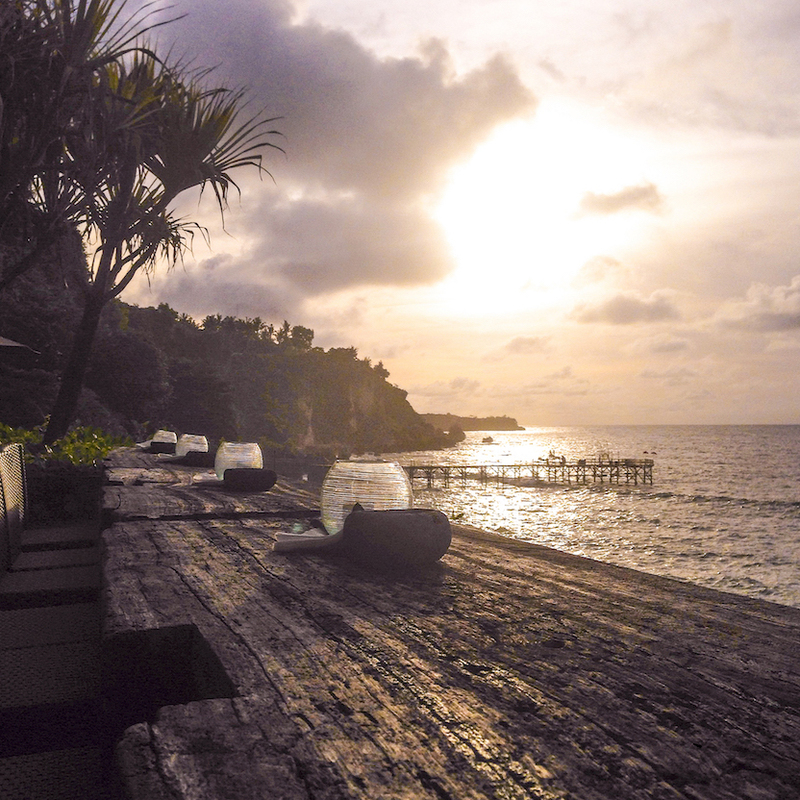 No doubt, it’s been around for a while and known as best of the best hotel and bar to watch the sunset. 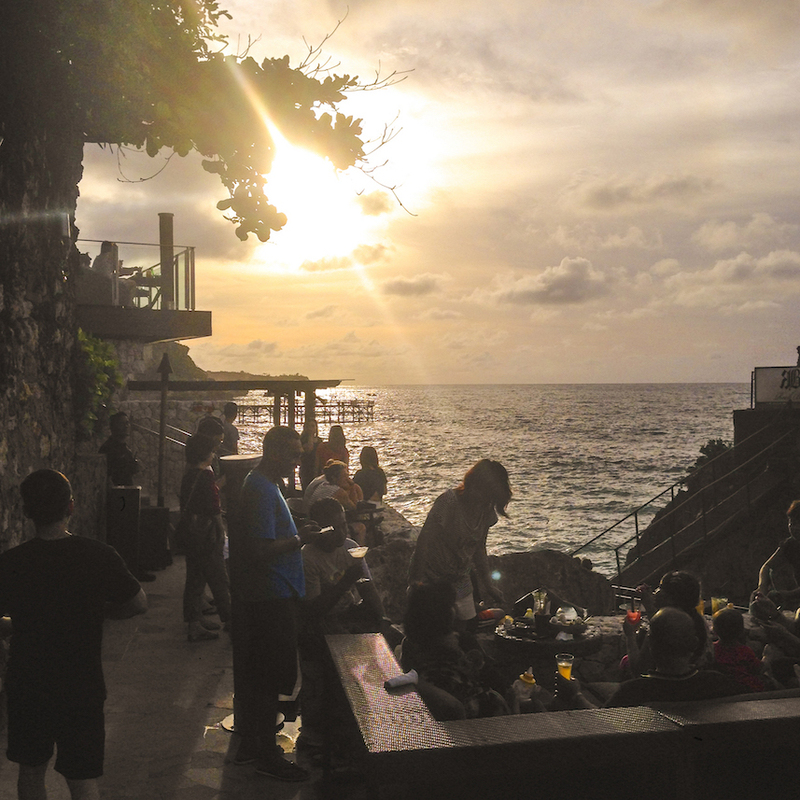 They’re famous as a place for wedding parties, also their famous bar at the cliff, Rock Bar. It’s only half an hour drive from El Kabron. 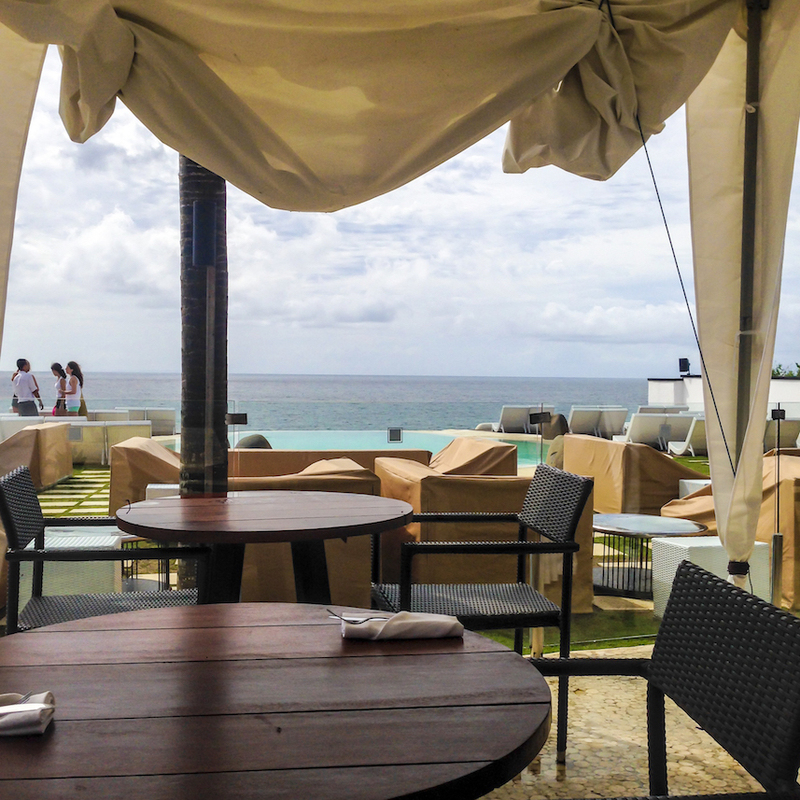 Ayana Resort is, of course amazing, 5 stars as you expect. 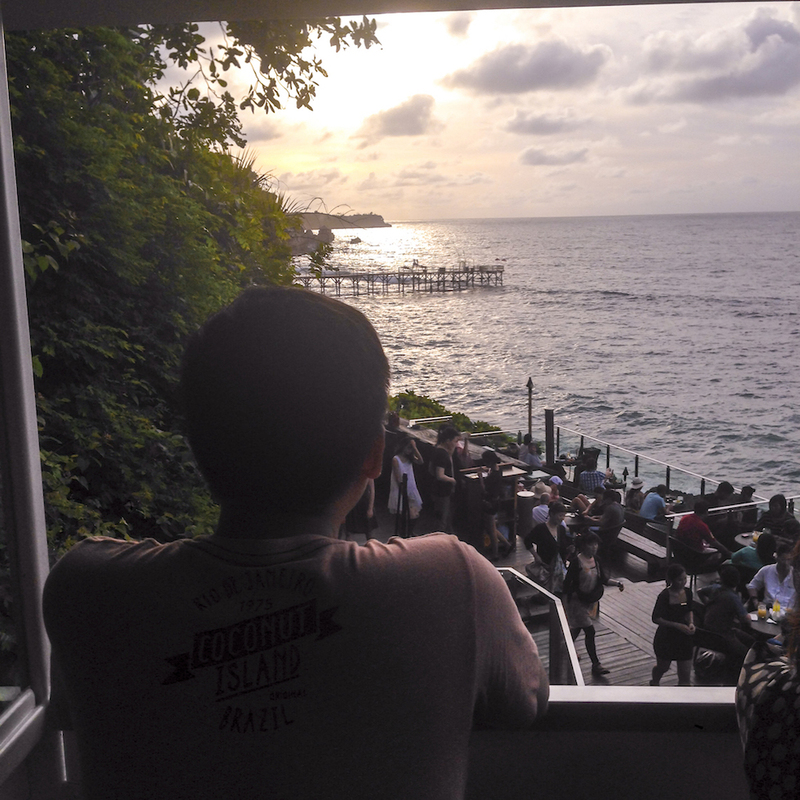 As soon as we’re here, it’s about time to watch the sunset in just 2 hours, and of course like everybody else who’s after sunset here, the queue for the cable car going down to Rock Bar is long. You can go down with a cable car, or you can just walk by foot. We skip the cable car because it’s not worth the waiting time. In fact, we enjoy more view with walking down the stairs. After walking about 5 minutes down, only to find the place is quite full. There were barely seats left, we even offered the table at the corner side of the cliff, like really corner of the corner, the view is not so good compared to any other seats there. But at least it’s kinda private, only 3 tables set here. 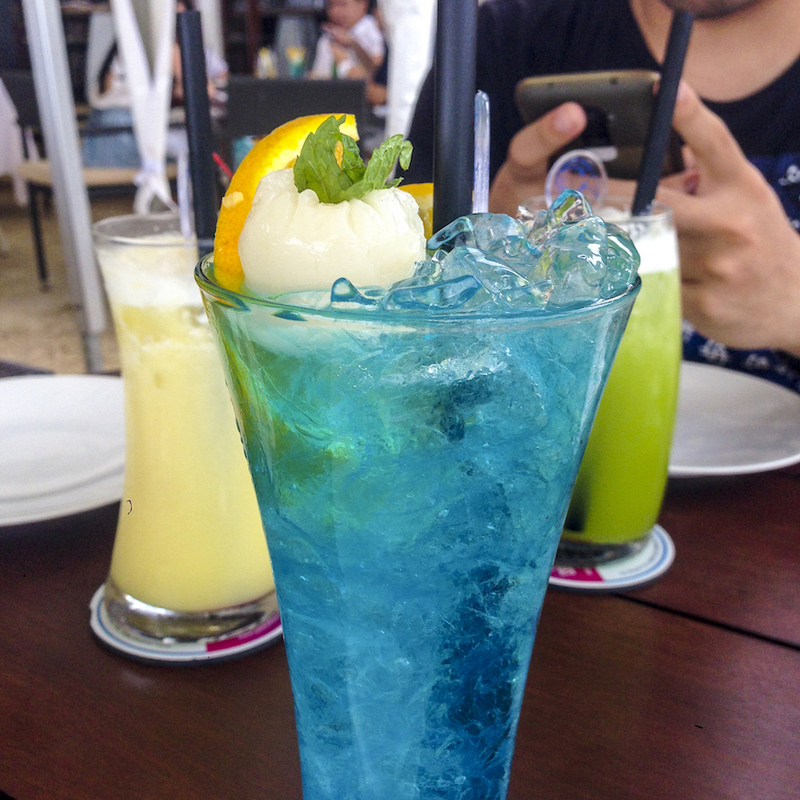 The staff who attend us was nice, we had snacks and drinks for a total of IDR 629,200. Pricing here is expensive, their range starts from IDR 140K something. Still, with that price, the tourists coming here more and more when it’s closer to sunset. We sat here for about 1,5 hours before finally leave. And yeah, they do have a beautiful sunset. Romantic, actually. When we leave, the queue waiting for cable car even crazy. I wonder why don’t they just take the stairs. Plus, they already ran out of seats down there, if those tourists coming down, where will they be seated? I think they should expand their seating capacity, it’s going viral. That evening, we’re back early to our hotel because we want to rest for a while before going back to Legian Street at night. This time, we’re not only exploring around but we tried Warung Made. It’s also a famous restaurant to eat, known for their open space setting and gas-lit lantern. So yeah, it’s dark. Price start from IDR 50K something for the main menu, I tried “Nasi Campur Babi”, rice with side dishes and pork, turns out pretty good. 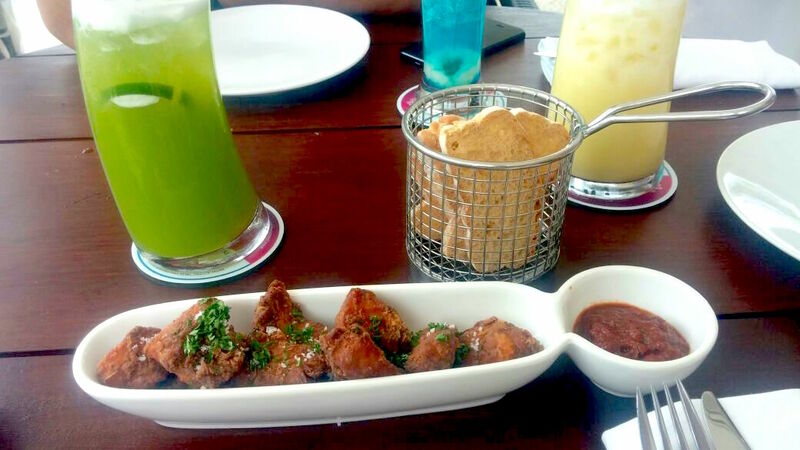 One of us ordered Ayam Betutu (Chicken Betutu), and it’s not recommended. We spent IDR 246,000 here. 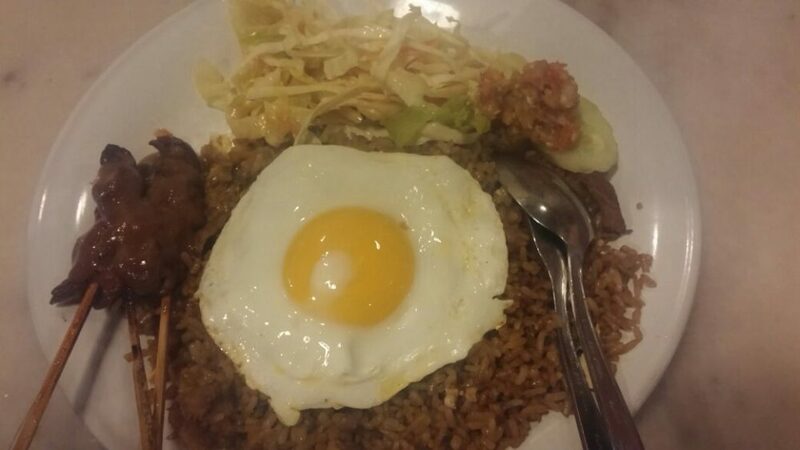 Finish with dinner, again we explore the streets, places such as Kuta Square, Discovery Mall, Beachwalk Mall, etc. We ended up shopping Fipper slipper, what we call in Indonesia with “Sandal Jepit”. By that time, we didn’t know that Fipper was already available in Jakarta, they said to us that this slipper can be found only in Bali. But, as soon as we’re back in Jakarta, there they are, Fipper available here and there. Feels cheated. We spent the night with more sight seeing the streets. A lot of food and souvenirs if you’re into shopping. And of course, as I mention in my earlier post, there are bars everywhere for you party lovers, lots of different promo for beers and wine. Go try some, champs! And that is the end of our day, the amazing experience from beaches to cliffs. Have you ever been to those places above? Do you have something to add? Share in the comment section, would love to hear what you’ve got. Don’t forget to subscribe, like and share. Until next post, bye! 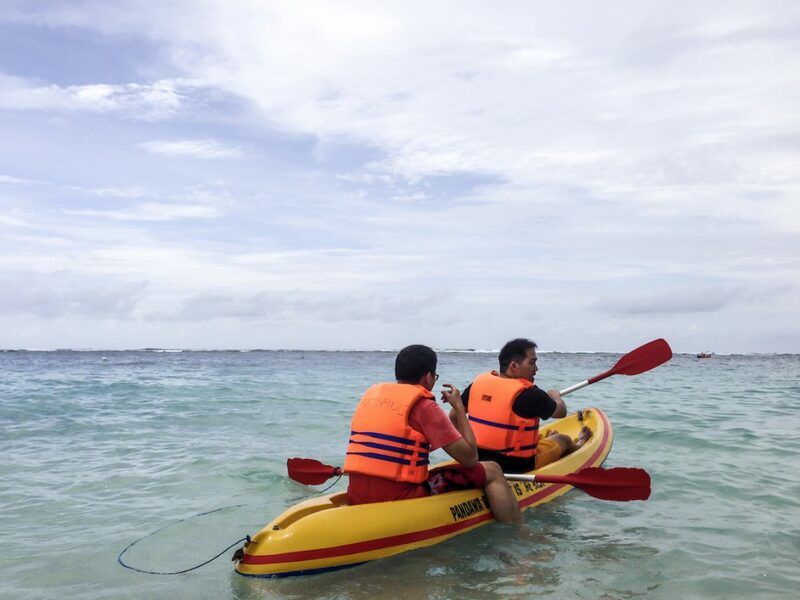 Enjoy your holiday with Ayana Resort. Best price!